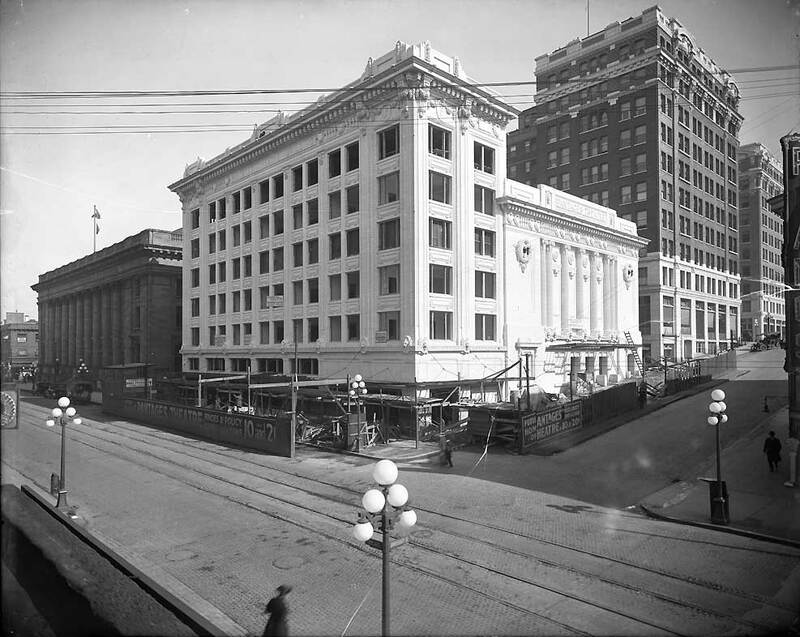 At the northeast corner of 3rd Ave. and University Street, Alexander Pantages opened this terra-cotta landmark in 1915, a likely date for this view of it during late construction. The tall “Pantages” sign has not yet been attached to the corner. “Benny” Marcus Priteca was a mere 23 when he took on the assignment to design the theatre. He was so admired by Pantages that he created scores more of the “vaudeville king’s” theatres across the continent. 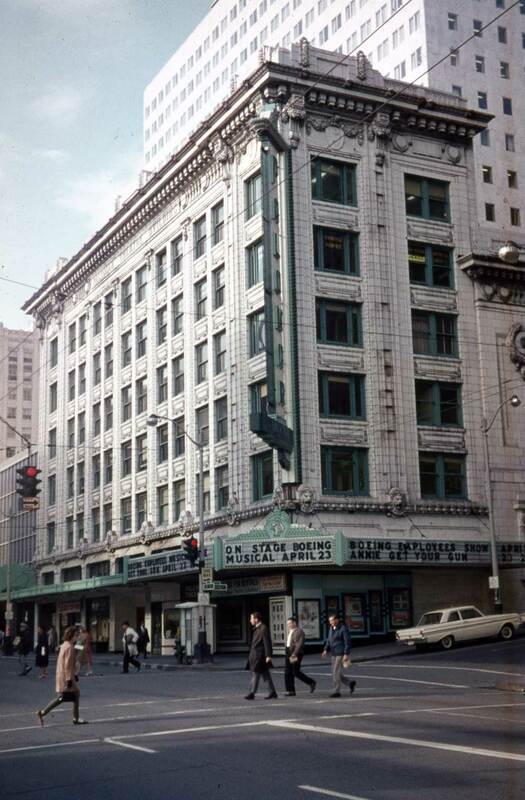 Like this Seattle Pantages, and the surviving Pantages in Tacoma, many of the bigger theatres were fronted with office blocks. Because this was also the anchor for Pantages’ chain of theatres the grand promoter himself took many of these offices facing Third Avenue. By 1926 there were 72 theatres in the Pantages circuit, which meant that traveling stage acts could be contracted for over a year of work and deals could be made. 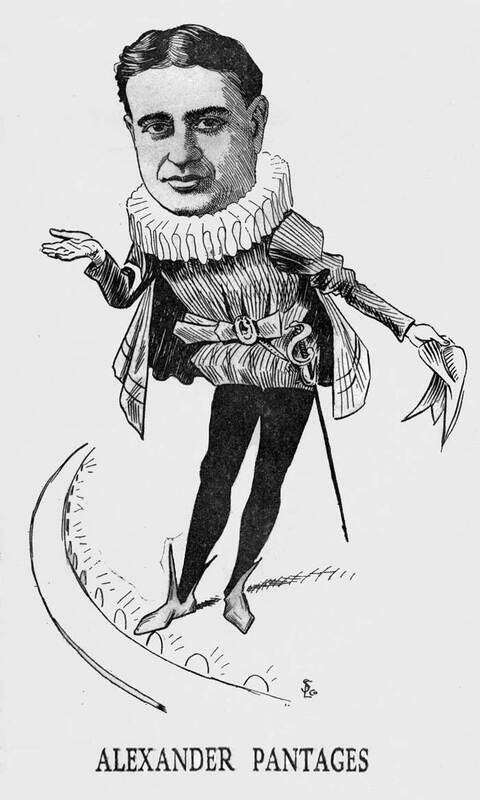 The standard faire was a mix of vaudeville and film, and some more famous performers like Al Jolson, Buster Keaton, and Sophie Tucker appeared at the Pantages in both, although not at the same time. After the Pantages became the Palomar in 1936 and then owned and operated by John Danz and his Sterling Theatre Company, film continued in a mix with stage acts, and Louis Armstrong, Duke Ellington, Peggy Lee, and a fresh Frank Sinatra climbed to this stage. The “Singing MC” Jerry Ross managed the Palomar from 1937 to 45, and for more years than those ran a theatrical booking agency out of the 6th floor. By famed restaurateur John Franco’s recounting, four flights down on the second floor a different “bookie” was running “horse book” – or race gambling – during the late depression when pay offs reached as far as the mayor – through the police. Jerry Ross was MC for the Pantages-Palomar’s “Last Curtain Party” on May 2 1965. The then locally popular Jackie Souders band played for the dancing. A year later the finishing touches were being bolted to the University Properties parking garage that took the place – sort of – of the then merely 50-year-old but lost classy landmark. Now follow two former now-then features that appeared first in Pacific Northwest magazine. The first shows Plymouth Congregational Church at the northeast corner of Third and University. It appeared in The Times on August 13, 2000 and gives a thumbnail history of the congregation – well, a clipping from that thumbnail. But it was written for a similar but different photograph of the sanctuary, one which I cannot for the moment uncover in my piles or files. But this later view will do, and it also reveals work progressing on the Federal Building, AKA the Post Office, behind it. So the date is early 20th century, say ca. 1906. We will skip any special “now” shot for this. We have Jean’s for the “lead” story (above) taken on the same corner. A few other views of this corner follow this first story. Each is briefly captioned. 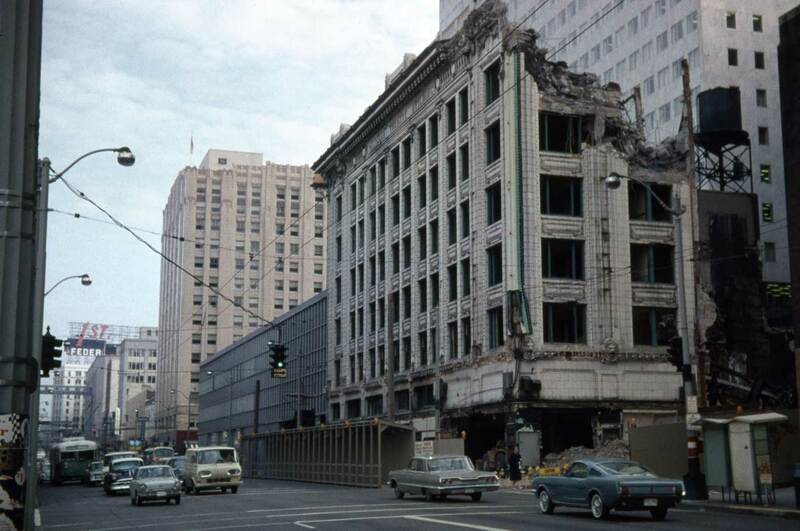 When I can find them we will post two or three slides of the Palomar’s destruction for the building of the parking garage, which is still in place. The second story is also about the influential downtown Congregationalists, and records a moment during the cornerstone laying of the church at its then new site on 6th Avenue between Seneca and University Streets, where it is still, although in a different “plant.” This feature originally appeared in The Times on May 22, 2005. The boom in building that followed the city’s “Great Fire” of 1889 was not, of course, limited to the burned district. 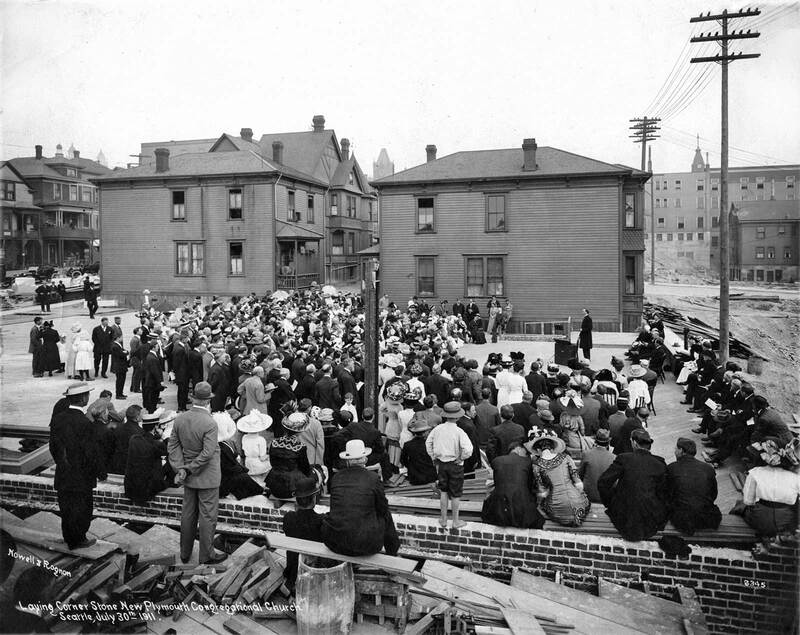 While the ruins cooled the local economy heated up as the march of immigration into Seattle during the late 1880s quickly broke into a stampede. 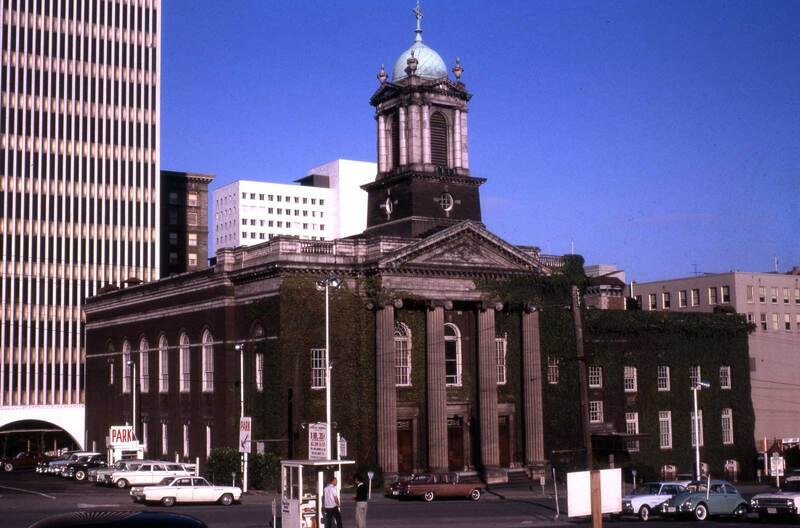 Although the original sanctuary of the local Congregationalists escaped the fire it was much too small for a congregation multiplying like loaves and fishes. The northeast corner lot at 3rd Avenue and University Street was purchased for a price considerably smaller than the $32,000 got for the sale of the original church site on Second Avenue between Seneca and Spring streets. That pioneer property had been donated 18 years earlier by Seattle pioneers and Plymouth parishioners Arthur and Mary Denny. From the beginning the list of Plymouth’s members was filled with local leaders. Following the 1889 fire Seattle was well stocked with architects – most of them new in town – searching the ruins for commissions. The Congregationalist’s, however, chose William E. Boone, an architect already responsible for many of the city’s pre-fire landmarks including Henry and Sara Yesler’s mansion also on Third Avenue. About the time he got the job in 1890 Boone formed a partnership with William H. Willcox, who brought with him considerable experience in building churches in the Midwest. Jeffrey Karl Ochsner, of the University of Washington’s School of Architecture, speculates that it may have been the experienced Wilcox who served as primary designer for this soaring brick pile done in the then still popular Gothic Revival style. The cornerstone for the new church was laid on July 31, 1891. A half year later the The Plymouth Church Herald announced to a congregation, which for the past year had been worshiping nearby in the Armory on Union Street, that although their new church was completed the pews were late in arriving and “inasmuch as the floor of the auditorium slopes, it will not be comfortable to attempt seating it with chairs.” While not elegant the parishioners response to this set back was direct — they shortened the back legs of the church’s chairs so that services in the new sanctuary could begin almost at once. 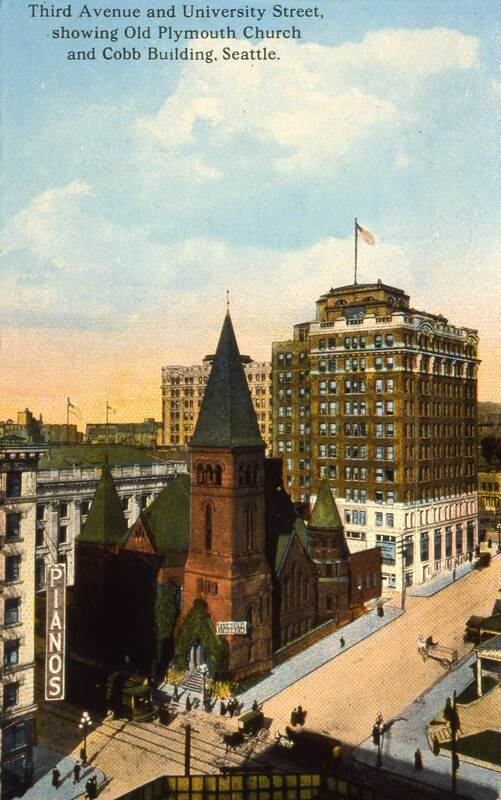 In 1910 after briefly considering developing their Third Avenue corner with a new combination church, office and business building, the congregation decided to build a new church three blocks east at 6th Avenue. Vaudeville impresario Alexander Pantages purchased the old corner and replaced this church will his namesake theater. 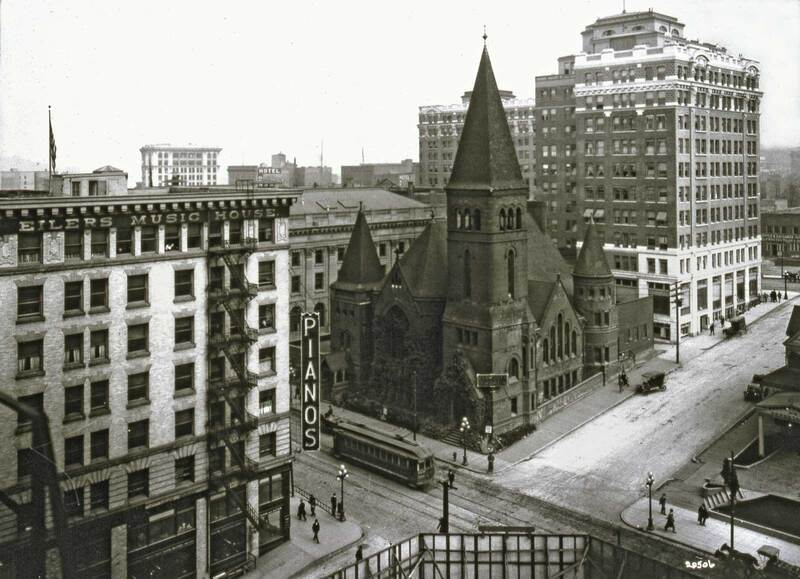 As a sign of those booming times, Pantages paid the church $325,000, or a little more than ten times what the Congregationalist’s received 20 years earlier for their original site on Second Avenue. Looking south on Third between Union and University Streets during the “big snow of 1916.” The postcard’s own claim that this was “the greatest snowstorm in history” is wrong. It takes second place to Seattle’s bigger snow of 1880. Readers may be now warming up to winter. 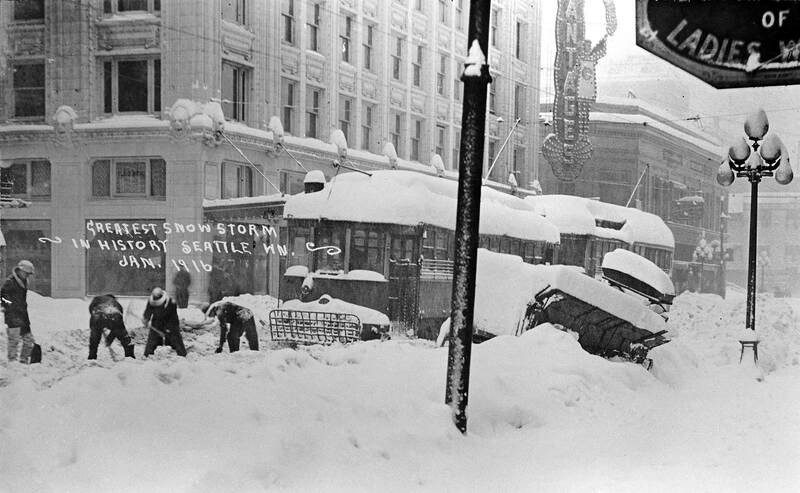 We remind you that we have a special “button” on this blog for a history of Seattle Snows where the 1880 and 1916 snows, and many others, are described and illustrated. Be prepared. NOW: As above, this view from University Street looks south to the block between 5th and 6th Avenues; also the contemporary repeat has been adjusted to show both the street and a portion of the neighboring IBM Building on the far right. 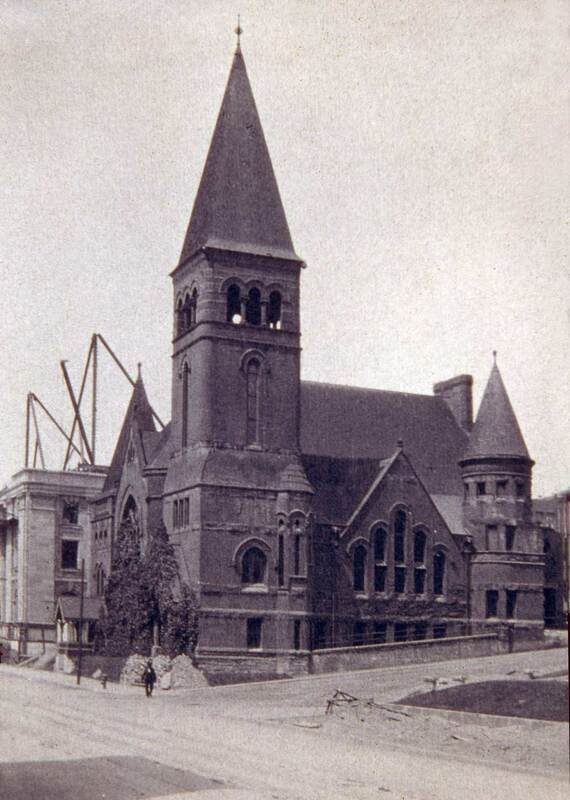 Here on the Sunday afternoon of July 30, 1911 at the southwest corner of University Street and Sixth Avenue the members of Plymouth Congregational Church are laying the cornerstone for their third sanctuary. A mere three blocks from their second home at the northeast corner of Third and University, Plymouth picked it after Alexander Pantages, the great theatre impresario, made the congregation an offer that was convincing. In a passage from the 1937 parish history The Path We Came By this scene is described. “The shabby old frame tenements of the neighborhood, gray with dust from regrade steam shovels, must have looked down in amazement at the crowd gathered there that Sunday afternoon, women in silks and enormous beflowered hats, men in their sober best.” From the scene’s evidence, bottom-center, we may add one barefoot boy with his pants rolled up. Fifty years later Plymouth’s interim senior minister, Dr. Vere Loper, described another dusty scene. “Wrecking equipment has leveled off buildings by the wholesale around us. The new freeway under construction is tearing up the earth in front of us, and the half bock behind us is being cleared for the beautiful IBM Building.” Plymouth’s answer was to stay put and rebuild. 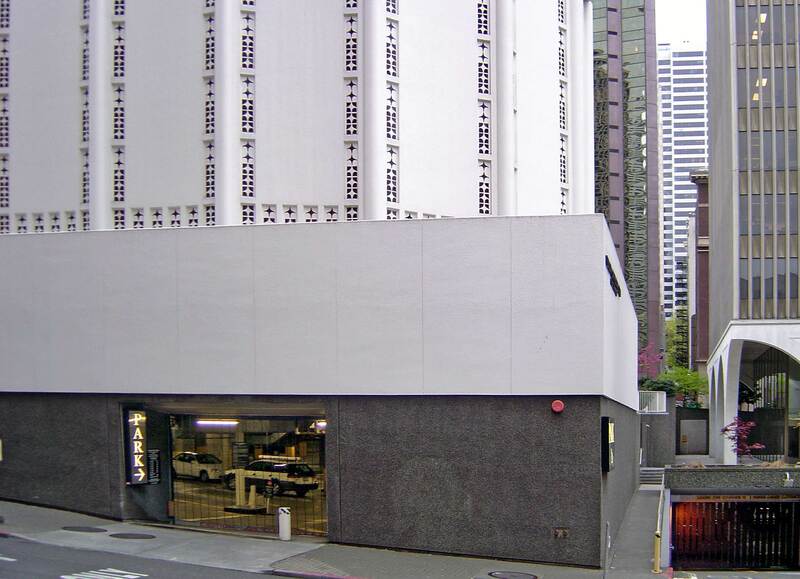 Opened in 1967, the new sanctuary was white and gleaming like its neighbor the IBM tower and seemed like a set with it, in part, because the same architectural firm, NBBJ, designed both. Gowey returned on March 21, 1966 to record the razing of the Plymouth church with a view that looks southwest thru the intersection of Sixth Avenue and University Street. 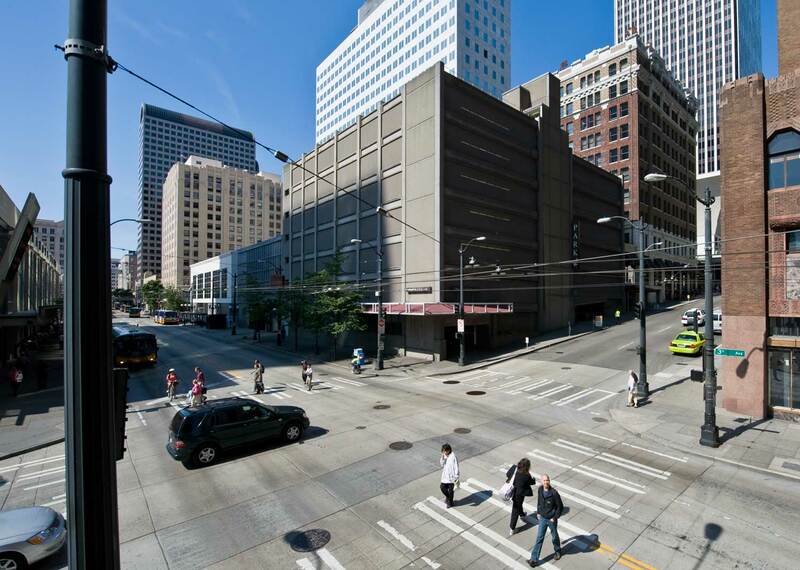 The columns that seemed doomed on the left were instead saved and moved to the northwest corner of Pike Street and Boren Avenue where they still stand to puzzle most motorists and pedestrians. We have written a piece about this, but will save the details for another occasion. Lawton Gowey has dated this 11th-hour photo of the Palomar Theatre, April 21, 1965, and describes the "On Stage Boeing Musical, April 23, Annie Get Your Gun," performed by Boeing Employees, as the Palomar's "last public show." 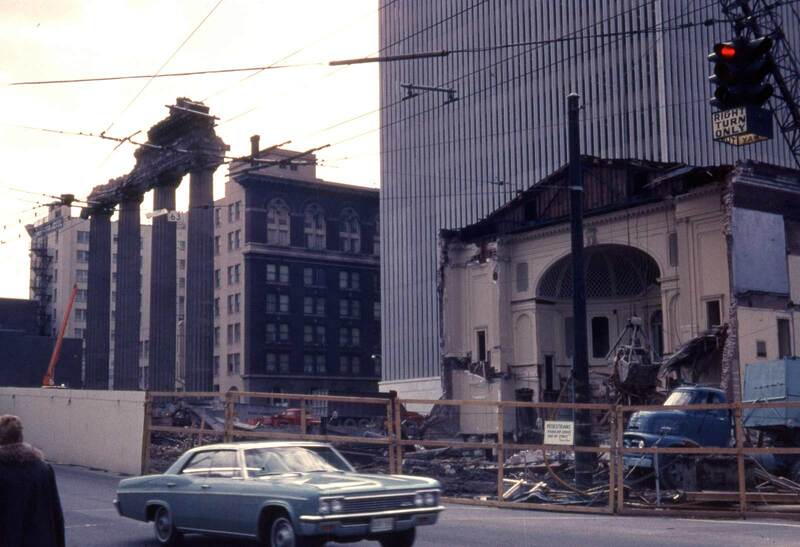 The razing of the Palomar was well along when Lawton Gowey recorded this slide of the destruction on June 22, 1965. 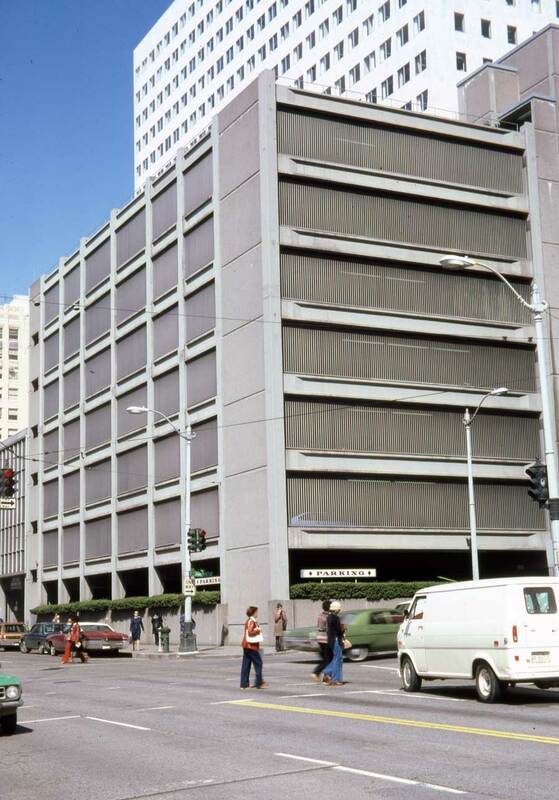 His water department office nearby, Gowey took this photo on April 7, 1978 of the parking garage that replaced the garage. Accolades again to Lawton Gowey and a beautiful match by Jean with his contemporary view! 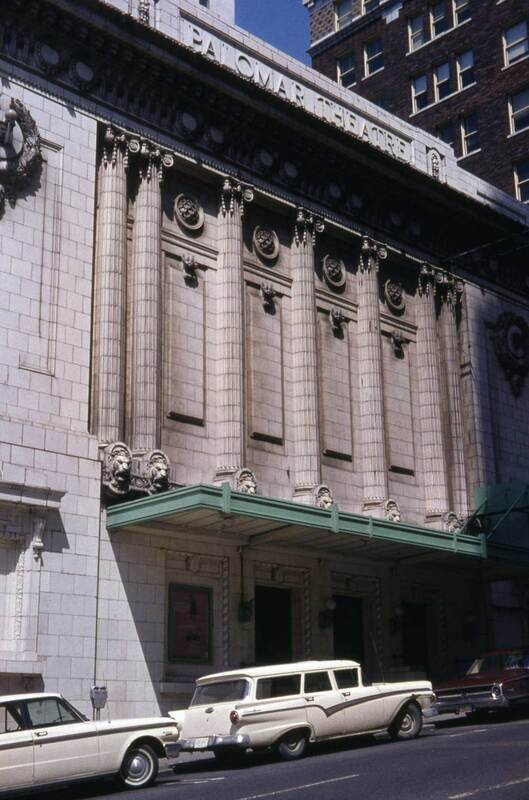 The marble and terra cotta edifice at 1304 3rd Avenue was Alexander Pantages’ fourth and final Seattle theater. While Pantages was making his fortune in Dawson and Skagway during the Alaska Gold Rush, John Considine and John Cort were paving the way for variety-vaudeville in Seattle and offered stiff competition for the Greek immigrant. He opened The Crystal at 1206 2nd Avenue, south of Pioneer Square in 1902. 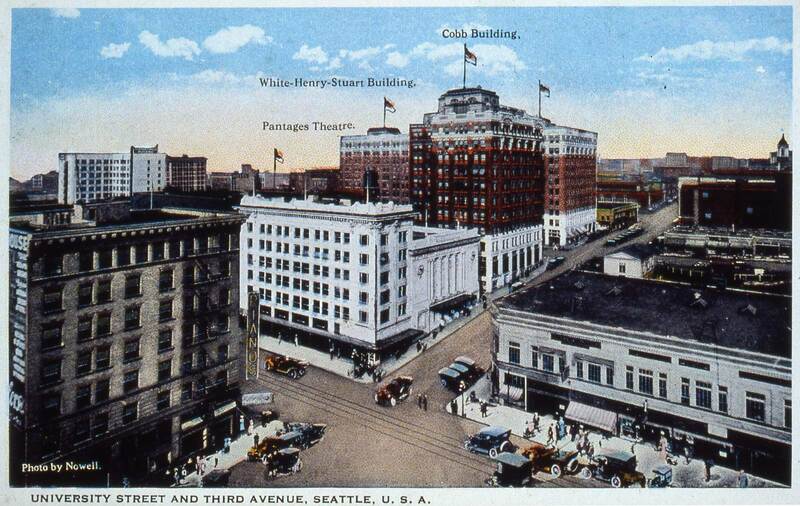 Seattle’s first “Pantages” opened at the northeast corner of 2nd and Seneca on October 10, 1904. The Lois, also managed by Pantages and named after his wife, opened across the street on the southeast corner two years later. The Lois closed after a December, 1911 fire and was eventually converted into a tennis club. Old timers may remember it as Germania Hall. When the 3rd and University Pantages opened in 1915, the older house was renamed Lois. The evolution of theater names is often a confusing game of musical chairs. Historian Chris Skullerud lists eight name changes for the 3rd Avenue theater, beginning with New Pantages, followed by Follies (1931), 3rd Avenue (1931), once again Pantages (1932), Rex (1935), Mayfair (1935), New Rex (1936), and finally Palomar (1936). Architect A.B. Heinsbergen “redecorated” 1304 3rd Avenue in 1923. Skullerud mentions a projection booth was added around this time. It can be difficult for modern moviegoers to comprehend the experience of film’s earliest introductions, screened form noisy projectors out in the open, whose vociferous, mechanical clickity-clack competed with musicians playing live accompaniment from the orchestra pit below. As one of the many acts featured in the program, movies began as a novelty. Vaudeville circuits adopted their own silly sounding brand name for film actualities and serials, such as “Pantagescope”. Published earlier this year, Eric Flom’s book, “Silent Film Stars on the Stages of Seattle” (McFarland & Company, Inc., Publishers) offers an incredibly detailed description of this and other Seattle theaters from the era. Appearances at the 3rd and University Pantages mentioned by Flom include Buster Keaton, Harry Langdon and Ben Turpin. I thoroughly enjoyed these photos and historical notes. Yet, and I’m sure I’m not the exception when it comes to expressing dismay at so-called progress. What absolutely ugly architecture that replaced beautifully “sculpted” buildings. I’m curious what happened to the Lion Head sculpures when the Palomar was demolished in 1965, any idea?